Come enjoy a blissful weekend during the summer solstice of relaxation, friendship, hiking, yoga, meditation great food and lots and lots of laughter. Inspired by nature and beautiful surroundings. 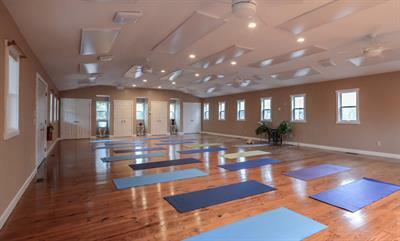 This will be Helen's 52nd retreat at Dahlonega Spa Resort!!! Her yoga retreats provide time and space to allow you to reconnect with yourself and your playfulness. Helen's welcoming and loving spirit makes everyone feel at home and her retreats are appropriate for all levels with beginners always welcomed! Helen has an eclectic spontaneous teaching style which makes her classes flow magically with class is never the same as another. She encourages her students to go inside and listen to their own expression of yoga. Her approach to yoga is non-competitive, spiritual and nurturing leaving her students rejuvenated on a very deep level. The healing life changing guided meditations Helen offers center and heal the body, mind and spirit. "Another (what am I up to…6?) retreat! It was extra special because my cousin Kim was able to join me who I credit for in getting me into yoga. Once I met Helen, and started my journey with yoga, my life changed in so many wonderful ways. Helen’s energy and caring is like an elixir to my soul, and through her yoga, I have learned to live every day with gratitude and a sense of ease. Thank-you for another wonderful weekend!! Namaste!"